This undated photo shows the Meigs County Sheriff’s Office in its early years, complete with a horse parked out front on Second Street. A drawing in the 1895 The Tribune-Telegraph shows what the jail, completed a year later, was to look like. 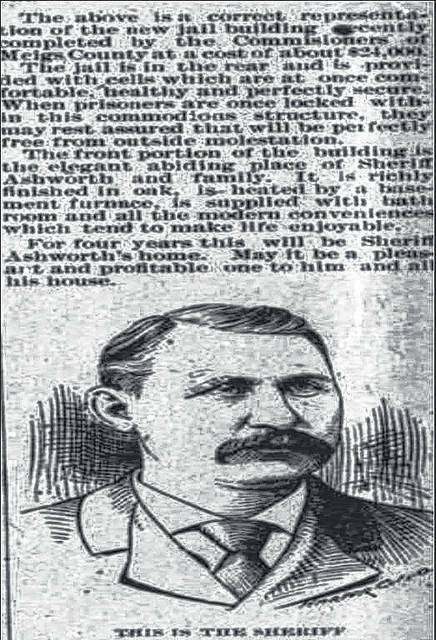 Sheriff A. P. Ashworth was the sheriff in 1896, moving his family into the newly constructed sheriff’s office, jail and residence building. This photo shows the Meigs County Sheriff’s Office as it currently stands. POMEROY — Did you know that the building where the Meigs County Sheriff’s Office and Jail are located once included a residence for the county’s top law enforcement official? From 1896 when the current facility was completed until the 1980s, the building located next to the Meigs County Courthouse was the home to the sheriff and his family, as well as the administrative office, office for deputies and the county jail. Sheriffs and their families from 1896 to 1984 lived in the residence portion of the building, according to sheriff’s office information. The building, which replaced the former sheriff’s office that was destroyed by fire was described in the local newspaper at the time as being “One of the finest buildings in the county” at the time of its construction. “The destruction of the old jail by fire February 4, 1894, at the time the Telegraph printing office was destroyed, made it necessary for the County Commissioners to erect another. At first it was the intention to put up a cheap affair, but after mature consideration it was decided to erect a modern building — one that would be a credit to the county and an ornament in the city of Pomeroy,” read a Sept. 4, 1895 article in The Tribune-Telegraph. Construction began in 1894 soon after the fire. The county added the former printing office property to county property at a cost of $1,700 and excavating work began. George Bauer of Pomeroy was awarded the contract for excavating work in the amount of $1,818.75. The front of the building, with its two corner towers, was designed to be 52-and-a-half feet high with the depth of the sheriff’s residence at 37-and-a-half feet deep. The towers, with their curved windows, continue to stand and are portions of the offices for the sheriff and other officers. The original windows remain in place today in the towers. The building was designed with 16 jail cells split among two stories in the building. The jail space was 36 feet long and 24 feet, 3 inches wide. On the first floor, the sheriff’s residence included a parlor on one side of the main hallway, with a kitchen, pantry and dining room on the other side. On the second floor was four “spacious” bedrooms and a bathroom. The stonework on the building was to be the gray sandstone, uniform in color, for the base. The 1895 article continually references that the material used for the building was the best of its kind available, from the sandstone to the Peach Bottom roofing slate. The total cost for the grounds and building was around $24,000. D. Findling of Pomeroy received $589 for the plastering work. The Sanitary Plumbing and Heating Company of Gallipolis was paid $1,905.12. The VanDorn Iron Company was paid $4,888.06 for iron and steel work. Pfarr and Genheimer of Pomeroy received $3,143.60, plus around $80 additional for carpenter work. Bauer, who received $1,818.75 for the excavation work, also received $1,461.62 for the foundation and $4,800 for the brick work and other work which totaled $10,706.77. The article notes that most of the $23,462.45 spent on the project went to people from Meigs County as preference was given to Meigs County residents. The currently 121-year-old facility continues to serve as the sheriff’s office and jail facility, although at a decreased capacity. What was a two-story, 16 cell jail currently is approved to house only five inmates for up to 12 days as it no longer passes jail inspections for a full jail facility. The second floor of the jail has been converted into an evidence room for the office. The building has undergone the normal wear and tear over the years, with current foundation concerns as the sandstone has worn over the years.